Size: approx. 15 mm. Photo: 05/16/15, 7 pm. This East Coast beetle is probably Dicerca punctulata. The genus has 24 species in North America. I found it on our black aluminum fence. 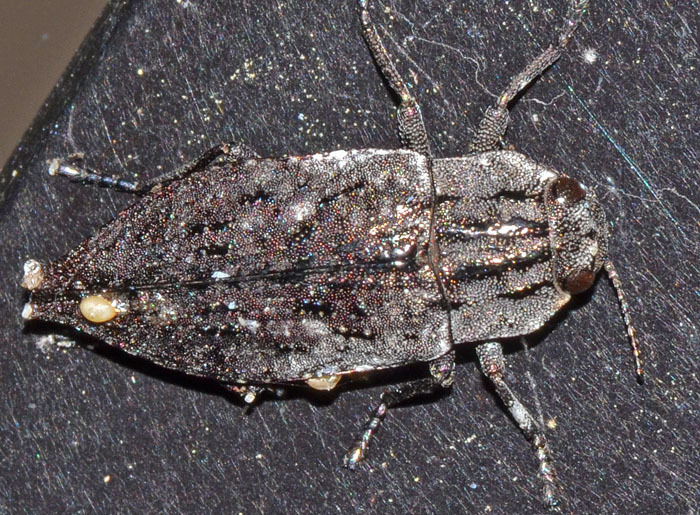 Perhaps it took its family name, Metallic Wood-boring Beetles, too seriously? In any case, the metal fence post provide an excellent camouflage. Its larvae can be found in pines and some species are known to hibernate as adults under loose bark.